4car garage mezzanine style! 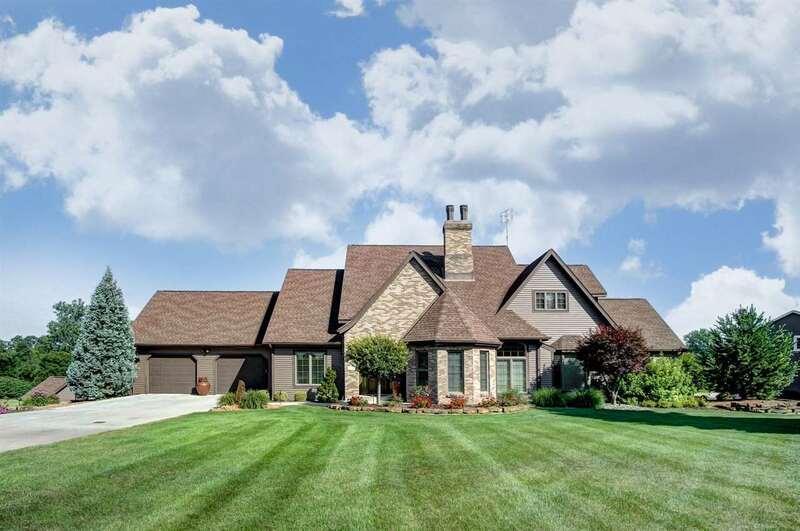 Stop in and see this gorgeous estate in Angola on just over 1.25 acres. This totally move-in ready 5BR/4.5BA home on a finished Daylight walkout basement has so much to offer. There are high end finishes throughout the home, including elegant light fixtures, rod iron railings imported from Italy, custom window coverings and more. There are high ceilings and lots of natural light let in by top quality windows and doors in many of the rooms. The spacious living room is a great place to entertain or relax and read a book by the fireplace. The extravagant kitchen is every chef&apos;s dream! It boasts an abundance of rustic designer cabinets and storage, granite countertops with a striking backsplash, a top-of-the-line cooktop, a built-in double oven, and a sub-zero fridge with two freezers. Enjoy a casual breakfast in the bay window nook or host a formal dinner in the separate dining room around the corner. On the main floor, you can find your luxurious Grand Master Bedroom with vaulted ceilings, a lovely fireplace, reading nook, and it&apos;s own master bath. The master bath features a soothing claw foot tub, separate tiled glass shower, and separate his and her granite vanities. There is also an enormous walk-in closet with many built-in shelves and storage areas for all of your clothes. Up the stairs you can find another master bedroom and 3 more bedrooms with spacious closets and multiple baths. Head downstairs into the finished basement and entertain family and friends in a huge open living area with a 3rd fireplace. No need to travel back upstairs for eating as there is a dinette and dining nook down here and a wet bar. Play games in the rec room or work out in your own personal gym too! Out back you can enjoy the convenience of an upper and lower deck to grill and entertain. You can access these spaces from the master bedroom, kitchen/dining area, and the basement. Take a dip in the in-ground commercial pool or sunbathe off to the side. Enjoy many mature trees on a beautifully landscaped property. This home has tons of extra storage out in the 4 car garage! There are 2 garage stalls fitting 2 cars each. Along with the storage there is also a full kitchen out there as well! With such pristine curb appeal and so much to offer, this home is just waiting for you to make it yours today!